The congregation reflects the retirement area and enjoys more traditional morning worship, but is open to explore new hymns (Singing the Faith & Songs of Fellowship) and worship styles. House groups meet regularly and there is a weekly Coffee Morning, Coffee and Tots and an active Women’s Fellowship. Seaton Methodists have good ecumenical links with ‘Christians Together’ and regular links with the URC. Evening services each 2nd Sunday of the month are in a more contemporary style. Messy Church is an ecumenical venture, once a month on a Friday evening, with 70-80 attending and thoroughly enjoying themselves. 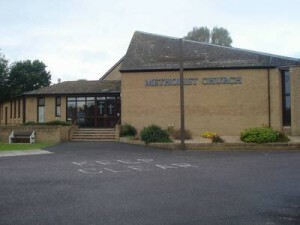 Situated on a mature housing estate, next to Seaton Hospital and Seaton Primary School, with a large church car park, the large, modern premises are well used by the community. 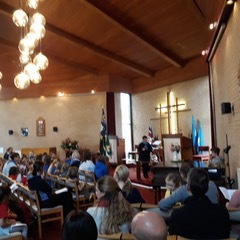 The work of Messy Church has continued to expand and the close links with Seaton Primary School have been strengthened. Some people from Axminster have been pleased to find a new ‘home’ at Seaton. 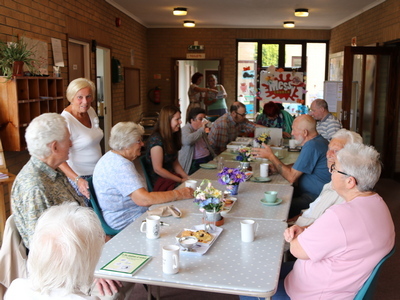 Seaton has its coffee morning every Thursday in the church foyer, attracting folk from both church and community. People often come for prayer at this time and Becky and Brian are there most weeks. World Thinking Day, celebrated each 22nd February. 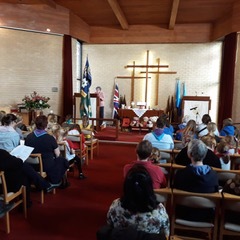 About 70 girls from the Axminster District Girl Guides gathered all afternoon at Seaton Methodist Church and then we had a church service to conclude our time together. We had a truest blessed afternoon where we thought about how we are all part of the World-wide families of Guiding and of God.